Update on the whole Patreon-situation, and my plans from now on is up in Patreon in a public post. TL; DR – I’m on Patreon until a better alternative presents itself, but I can’t drop and run right now. Your continued support is deeply, deeply appreciated. ALSO because my backers are great and wonderful people and make me cry with gratitude, I’ve decided to open up December’s character-creation-poll to everyone! Yes, including you. Because this whole thing is a heck and you make it less so. Ooh, ooh! Masa is about to activate Berserk Mode! Oh man. Just wait til he finds out that chick lied. 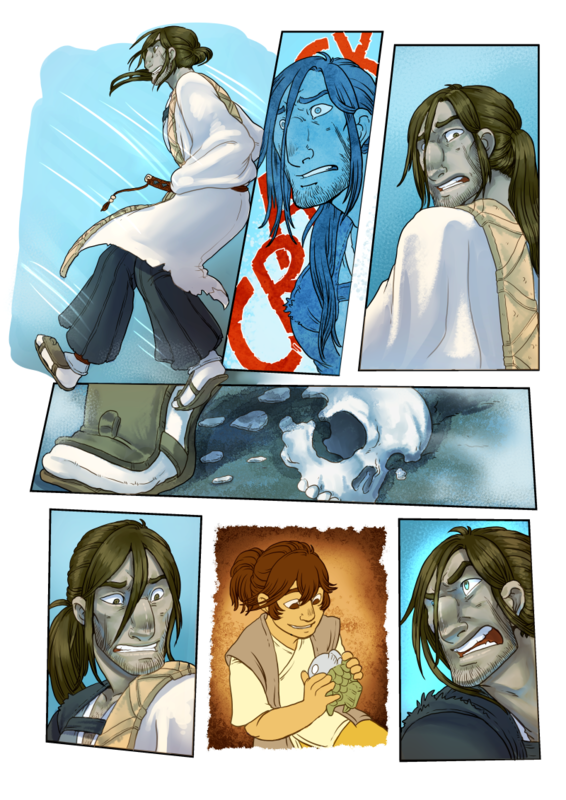 Grassblades used to be cross-posted on Tapas/Tapastic, until they changed their Terms of Service in a way that had a potential negative impact on creators, without properly informing the creators beforehand – and the atmosphere on the forums grew so hostile that I no longer felt welcome there. I’ve stopped posting there, for the sake of my mental health. They might have changed for the better, but I doubt I will ever go back.